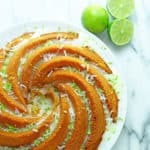 A classic bundt gets a tropical update. This key lime coconut pound cake combines fantastic citrus flavors with the subtle intensity of coconut. Preheat oven to 315°F. Prepare a 10 inch bundt pan with non-stick method of your choice. Combine butter and sugar in stand mixer bowl, and beat on high speed until light and fluffy for at least 6-7 minutes. There is no leavening in this cake so you must whip as much air into the batter as possible to get the lift you want. Slowly add flour in increments to mixture but be careful not to overbeat at this point. Add in key lime juice and coconut extract and mix until just combined. Pour cake batter into prepared bundt pan, and bake for 1 hour and 15-20 minutes. Cool in pan on a wire rack for 10 minutes, then remove from bundt pan to cake or serving plates. Stir together confectioner's sugar and lime juice until its pourable. Spoon over the cake and sprinkle with coconut and lime zest and serve.